The first missionaries to arrive in the islands were from New England. Sailing in the Thaddeus, 14 missionaries (seven couples) and four Hawaiian boys left Boston. They arrived in Hawai’i after 164 days. While at sea, Kamehameha the great died, his son Liholiho became ruler, and the ancient kapu system was abolished, with no belief system to take its place. 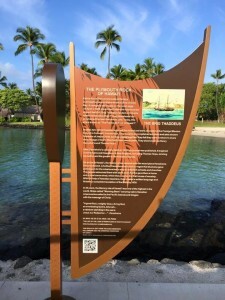 This historic marker was designed for the local churches to commemorate the 195th anniversary of the fulfillment of Hawaiian high priest Hewahewa’s prophecy: that the new God would come to this same rock. Hewahewa himself burned his own temple in faith of what was coming. The first man ashore brought his Bible, protected in a black wooden box as he stepped on the very same rock at Kailua pier, changing Hawaii forever. With the prophecy complete, many of the Ali’i royalty of Hawaii became Christians and avid readers of scripture. 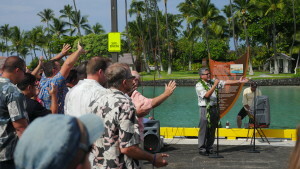 Kahu (Pastors) bless the Historical Marker at the Kailua pier. We gratefully honor Mokuaikaua Church, Frank & Rosemary Miller, Calvary Church, Legacy Church, Living Stones, Kona Coast Chaplaincy, Central Kona Union Church, Holualoa Chapel, Samoan Church of Hawaii LMS, Helani Church, St. Michael the Archangel Parish, Haili Congregational Church, Kuhio Chapel, Waipahu United Church of Christ, Gospel of Salvation Church, Kahikiola Congregational Church, Kona Church of God, Family Foundations International, Corinth Reformed Church, Rev. Abraham Akaka Ministries Foundation and the University of the Nations for their generosity. 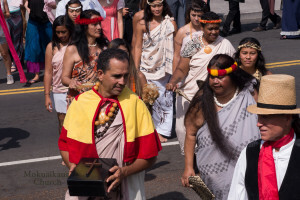 The first Christian church established in the Hawaiian Islands lives on to this day in an active and caring fellowship called Mokuaikaua Church.